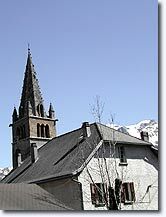 Departement of the Alpes de Haute Provence - Pop. : 700 h. - Altitude : 1.100m. 1 km from Barcelonnette via the D9. 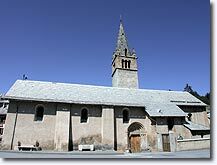 In the Middle Ages, Saint Pons was one of the main villages in the Ubaye valley along with Faucon. 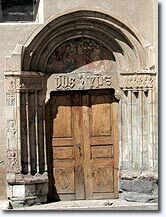 Today it consists of a few houses scattered around a marvellous church (late Durancien Romanesque art, 13th to 15th century), which has been listed as a historic monument and it is endowed with a richly sculpted portal (12th century. 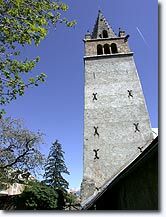 St Pons exudes good mountain air and perfect serenity between its shaded meadows speckled with pines and the many high peaks it has as a backdrop. The inquisitive will notice the large building at the entrance to the village. It is probably a former convent. Its façade is decorated with a sundial dated 1828. You will be enchanted by a stroll in the village with its baker's oven and its old wash house, its hens pecking in a garden, and the refreshing rush of its little torrent, the Riou Bourdoux. It is worth noting, however, that this torrent which is so picturesque today was for a long time one of the most dreaded in Europe, carrying everything before it, before being contained at great cost. Hundreds of dams were built and millions of trees were planted! 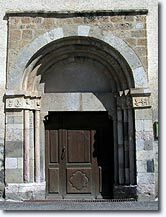 listed as a historic monument, with its 12th century portal. Gliding. Go-karting. Fitness trails. Hiking. The Riou Bourdoux discovery trail has signs along it that explain how man "tamed" the torrent. Les Thuiles (7 km), Barcelonnette (2 km) and Faucon de Barcelonnette (4 km).